At age four I had the ski scene dialed. I dressed myself in warm winter clothes, put on my boots and skis, and pushed along with huge poles; and I could usually pee in the snow instead of my pants. Ontario was beat, so my parents packed older bro Dan and I into the family grocery-getter, and made like the Griswolds across the country, skidding into the snowy parking lot of Silver Star Mountain Resort. Our week’s winter wonderland adventure was burned into my tiny brain and has influenced most major decisions I’ve made since. 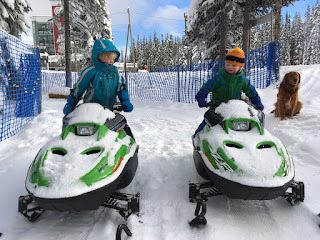 Half a lifetime later, my wife and I packed our own 4 & 2 yr old boys into our adventure wagon and left the Coast Range for a kid-friendlier place to enjoy the snow. Although Silver Star village and resort has expanded, it still has the charm of a winter fairy tale, and we arrived for the best day of the season. After eating pancakes and watching the groomers finish on the hill, we skied out the door into fresh cold snow and sunshine. 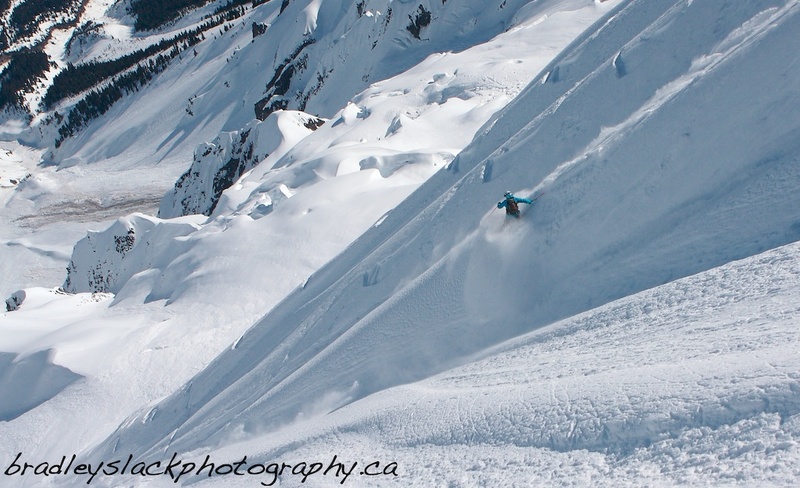 Jonah and I lapped the magic carpet, while Pam and Micah explored some green and blue runs. When the boys needed to refuel with hot-chocolate I pounded laps of boot deep snow until the setting sun and closing lifts forced me indoors. Off-piste action at Silver Star included tobogganing through the village, racing mini-snowmobiles, skating and of course hot-tubing; making our adventure rich with memories that might also shape the lives of our boys. I love the seasonal transitions we experience in British Columbia as crisp air and brilliant colors invite the first abstract snowflakes that purify the hills. But beneath this euphoria lies anxiety as the pre-winter to-do list is daunting: fill the wood shed, finish the chicken coop, build a sauna, fund raise and plan for the inaugural ski, snowboard & mt. bike academy at Pemberton Secondary School, get back in shape, and fill the freezer with freshly harvested game. Hunting the elusive blacktail / mule deer hybrid buck is a sure way to regain cardiovascular fitness, muscle tone and agility, and sharpen the senses to notice and react instantaneously to the surroundings with hair splitting accuracy - all elements necessary for mountain survival. I grew up hunting in Northern Ontario, where generations of Treadways passed down their local knowledge of living off the land; and now as an immigrant to the coast range I've had to start anew. After years prying information from locals and field testing, I was rewarded with a big stinky buck! Each year I have filled my two deer tags, but this past week was the first worthy buck I've lined up in my sights. Micah was ecstatic about 'Big Stinky', Jonah was still happy with his spike horns from last week's harvest, and I am very grateful for a freezer full of goodness to fuel the fire in these two mini shredders. 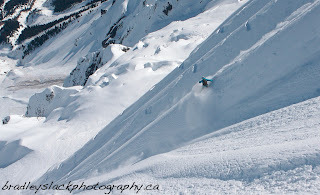 Now it's time to start hunting down some big mountain lines on skis and my fresh split board. 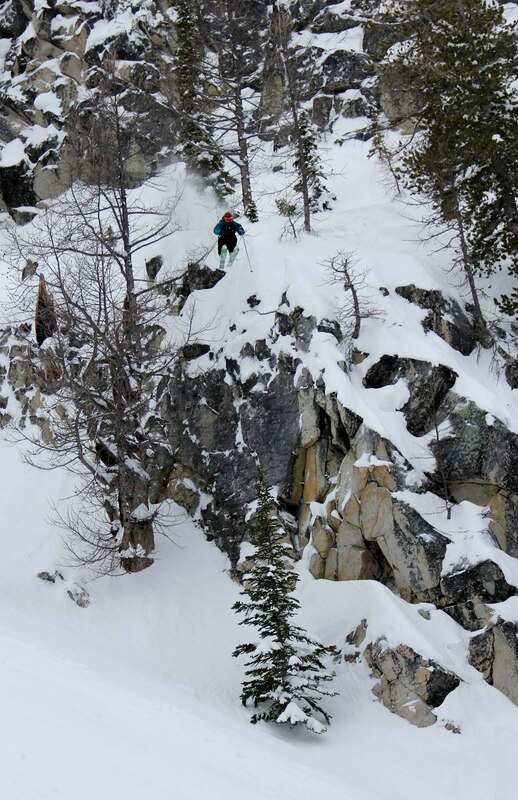 I didn't ski much on last year's thin and sketchy snowpack, but when conditions aligned, I took full advantage. Here are a few lines from the season. Well this season was busier than any I can remember. My wife and I had our first son last summer, and I took on a full time teaching position for the year, so my skiing was limited to holidays and weekends. That being said, I still got out into the mountains regularly, and continued to push to accomplish some goals in the Pemberton backcountry. 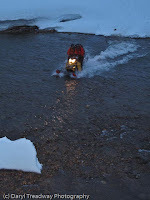 Over the Christmas holidays I snowmobiled into a cabin with my Dad and younger brother Dave. 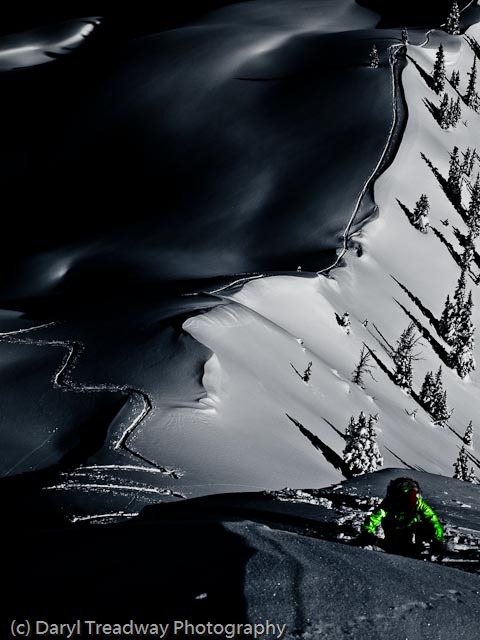 We were able to explore some new territory and bag some fun lines, including some south aspects that hadn’t yet seen the sun, and a full moon lap. It was a trip I’d wanted to do with my dad for a long time, and great memories were made. 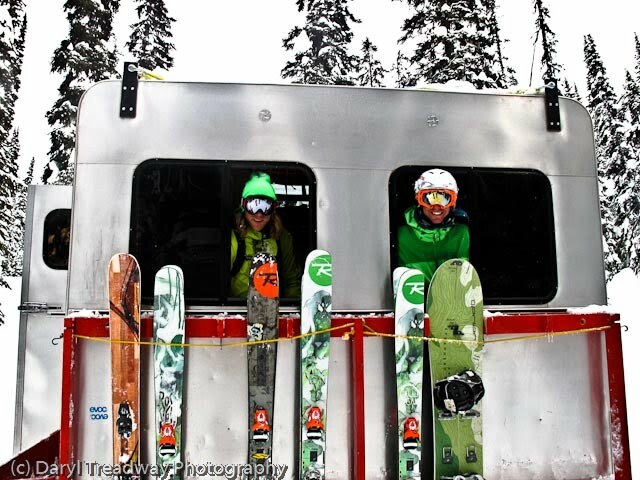 Additionally, I shot photos with Blake Jorgensen and Bryn Hughes which will be distributed to various international ski magazines. A big accomplishment for me this year was completing with honors the Avalanche Operations Level 1, which was snowmobile specific and focused on search and rescue scenarios. I was 1 of 16 people from search and rescue groups throughout BC awarded with a bursary for the course. 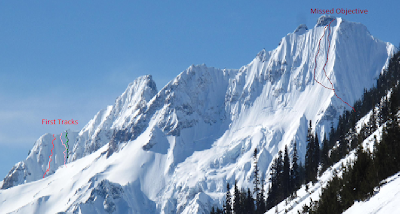 It was good to have my snowsence reassured, and learn more about mountain behavior. While not chasing the snow this summer, I have been chasing white water in my kayak, covering ground on my mountain bike, enjoying lake life in my home town of Kenora, Ontario, and surfing in El Salvador. Thank you for your support this year; you make my adventures possible. On the first day of fall, 2007, while camped beside a hot-spring laden river, I asked my girlfriend Pam to be my wife. 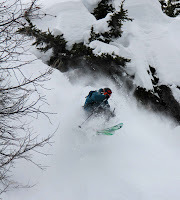 Last week I returned to the mountains that loom thousands of feet above those hot-springs with hopes of getting back onto a big spine wall that we skied last year; but uncertain snow stability forced us off the welcoming face, and so I spent the past week riding a rollercoaster of emotions. Despite my mixed bag of apprehension and anticipation, I felt welcomed back to this rugged place as we rode into camp Friday eve, and glassed the North West face we hoped to ski. Dave B. pulled an all-nighter and met Joe, Brad and I at 5:30 as we tandemed sleds near the top of the highest peak in sight. An hour later, we had climbed, down-climbed, traversed, then climbed again, and were peering over our sunny North East facing spines. 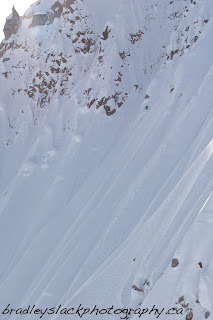 Brad took position on a knife edge arête to take photos, while Joe, Dave and I skied adjacent spines of perfect pow. 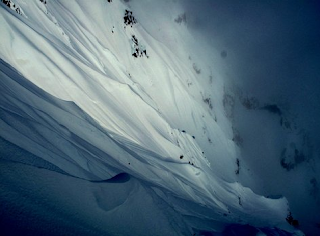 We cut off the face to the arête and waited for Brad before dropping into the dark North West face where more spines continued. After 1000 meters of steep cold skiing, and another 1000 meters of warm tree skiing, we were back at our sleds, all smiles and slapping high fives. We grabbed lunch while examining our work of art, and then headed back up to retrieve the sleds at the top when disaster struck. Dave’s sled blew up and we spent the next 10 hrs towing, pushing, pulling, digging, sweating, and swearing, and managed to get it out to the main trail by 10:30. Too tired to eat, I refueled with Dave’s Kokanee Golds and passed out soon after midnight. With just enough energy left we pulled another dawn patrol. 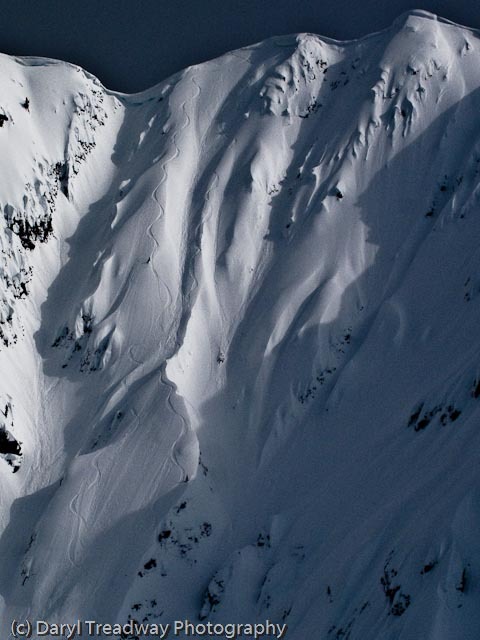 This time we wanted the long, steep, unskied North West spines. On the ridge, I was able to cut a small hole out of cornice and peer down; wow, what a sight. Again Brad set up on a ridge and captured the moments that Joe and I rode the never ending spines. 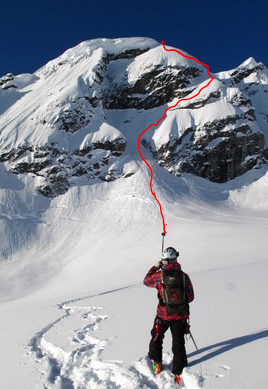 The main spine I skied eventually ended, but I was only half way down the main face, so I kept moving right, and catching more and more steep and deep spines. It was the perfect run. I was pretty much speechless at the bottom as Joe and I traded knuckles, smiles and a nod. 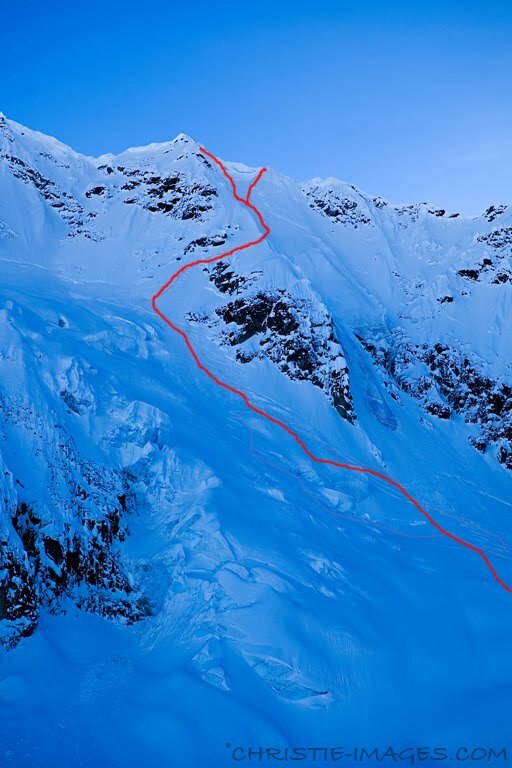 This was a big personal accomplishment for us, and it will shed new light on how we look at and ski other big mountains. Hopefully this September I’ll return with my wife and newborn child to again relax in the pools, while gawking up at some fresh snow, and reflect on the abundant life we have here. The Coast Range has been hiding behind a veil of storms, high winds, flat light, avi hazards, and unfortunate timing. Until recently I have waited impatiently, attempting to satisfy the hunger by pow-tree skiing, but the anticipation was driving me mad; we had to get into the alpine. And so, as we annually celebrate the rising Son, we again celebrate the secular gifts Easter brings: sled access big mountain lines! Joe Lax and I planned to ski a tight group of volcanoes that haunt the horizon of our valley. After a grueling day of trail blazing into the alpine we returned to find bro Dave with a welcome fire warming the cabin. south ridge, we were dangerously close to a loaded pocket of solar affected snow pack and when Dave and Joe crossed the top of the pocket, connecting the dots between rocks and exposing a shallow start zone, it slid. I was still shaking as Joe wiggled down another spine, aired the 'chrund and slid to a stop as we high fived. 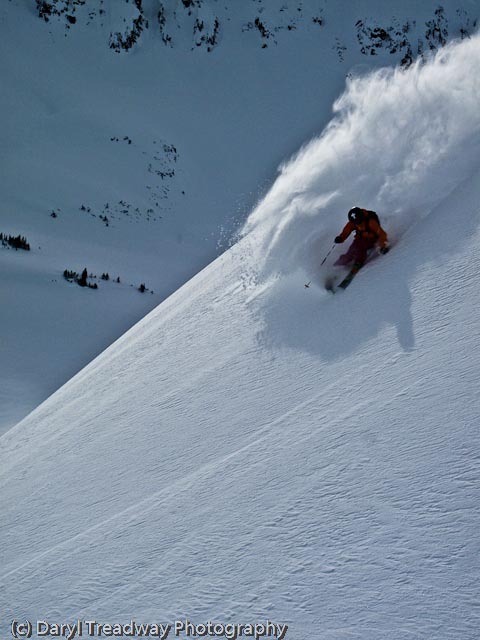 Dave again found the trigger to a convex pocket at the top of his line which peeled, and stripped his line of snow, forcing him to an adjacent spine. stability tightened, snow lightened, and we were able to confidently step out into the back yard. 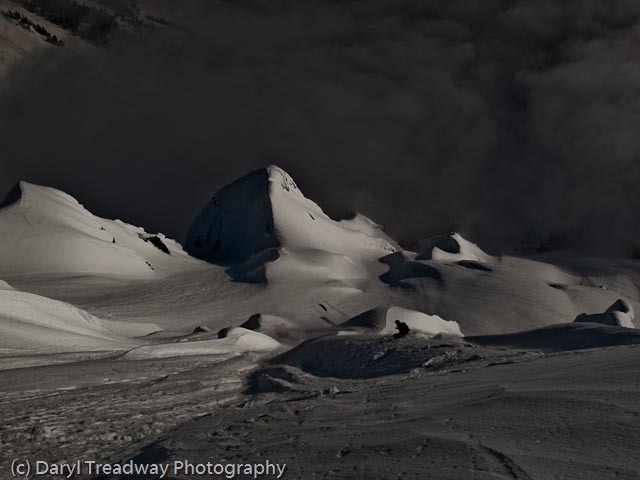 Up at 4:30, sledding by 5:30, on top at 7:30 ready to drop as the sun lit up this NE facing ridge. Check out the video of some fun lines. When Bob Legasa tracked me down to film with his crew from Peak Video / Freeride Productions at North Cascade Heli ops in northern W.A., my ruber arm was contorted, and I accepted my mission of driving 10 hrs each way for two possibly days of heli skiing. 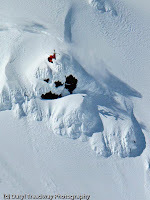 On day 1 the heli remained grounded and became less visable under the falling snow. 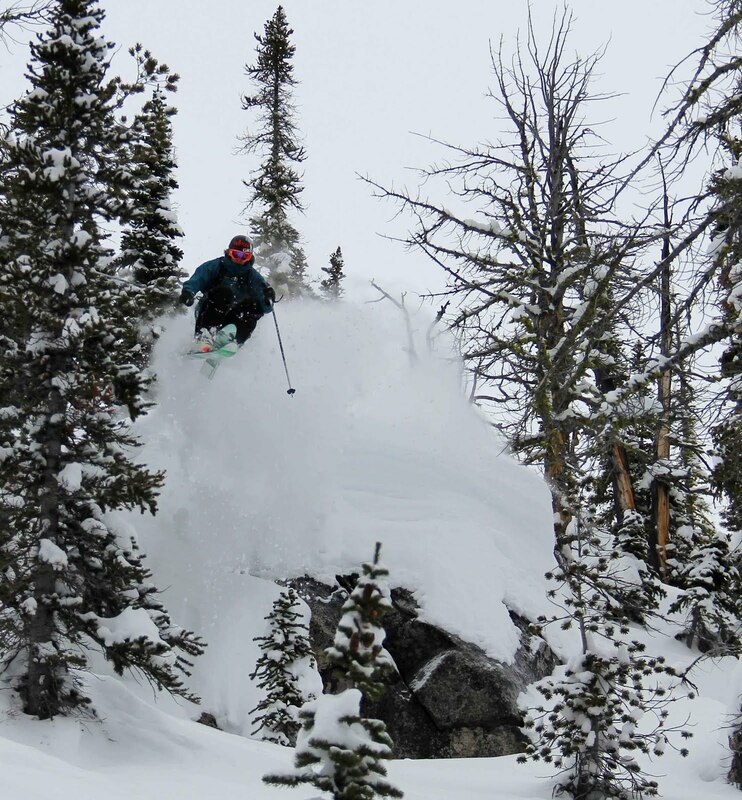 Our consolation prize was cat skiing in blower pow! Not bad. where we filmed sub-alpine pow shots and a few airs. 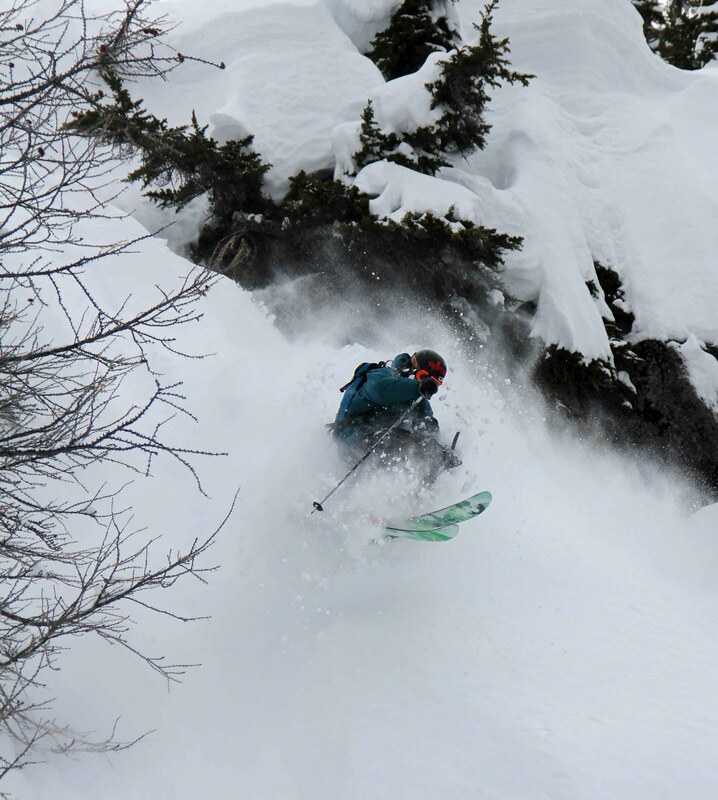 The crew of skiers was vast, including John Stifter, senior editor for Powder magazine, who joined us for some birthday faceshots and good times. 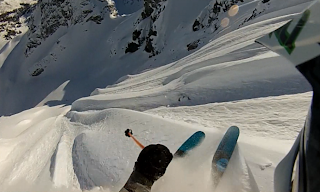 It was a whirlwind trip of sketchy roads, good snow, new friendships, great food, and fun skiing. 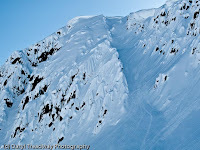 Through the success and failures of this season's skiing, I've realized how some lines are really a gift to be shredded when proper snow, light, stability, and stars align; while other mountains are not for the faint of heart, and don't grant access until they are ready ... or until we are ready. This week bro Dave and I stood on the shoulders of giants as we joined veterans Dave B. and Jon Johnson in pioneering a new route up a rugged volcano. Combining our experience and skills we made like mullets and attacked from the back, shaving off 6 hrs from the traditional ascent. 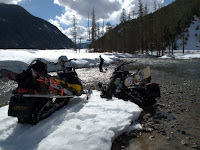 Our modern approach took advantage of modern technology in snowmobiles, and we rode tandem over rivers, through avi paths, around crevasses, and up near vertical walls. After an hour and 6500 feet of elevation gain we traded 2-strokes for crampons and an easy boot back later we peered over the edge for a long anticipated view. Despite the previous day's efforts putting in a sled track, and previous years of exploring the area, today's run was a gift. The sun had just come over the mountains, the valley clouds were holding off, and the snow was perfect. We were in the right place at the right time, in the right mind, and with the right people. 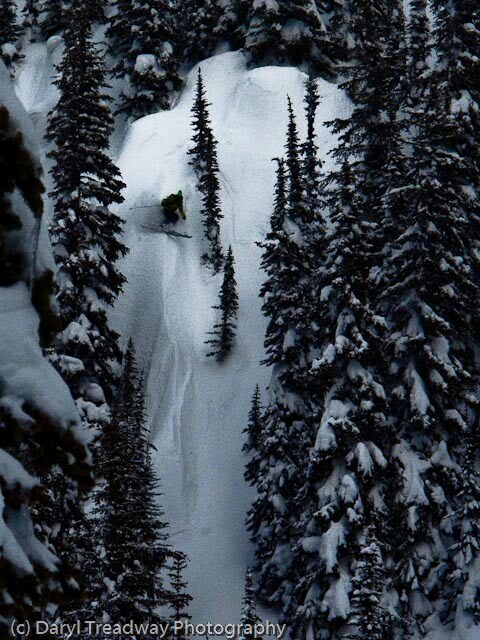 Dave dropped first, bouncing from side to side down a 1500 foot spine to a safe perch. I followed on an adjacent spine that split into a snake tongue, steepened, cruxed, then spined again. 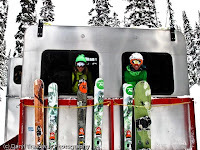 I skied out the fan screaming with double fist pumps and grinning ear to ear. Jon and Dave B. had a different entrance, but similar results. 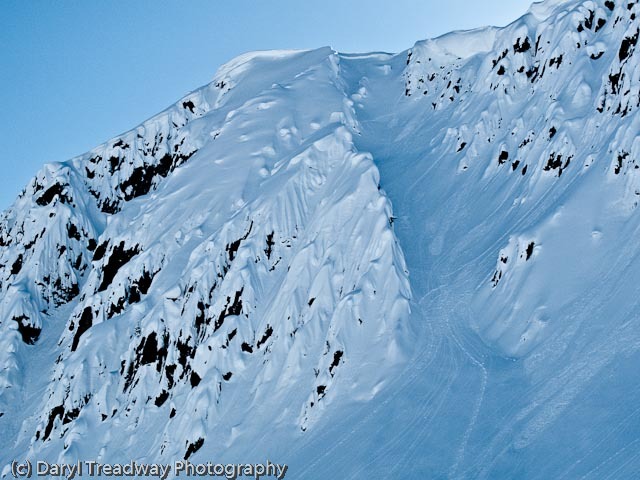 This upper face is really the gem, but we still had a mile of vert. to descend to our waiting snowmobiles. By 9:30 AM we were back at base camp, drinks in hand, toasting our fortune filled lines that loomed far overhead. This is a significant peak that has stared me down many days, including the morning my wife and I were engaged at it's volcanic base. 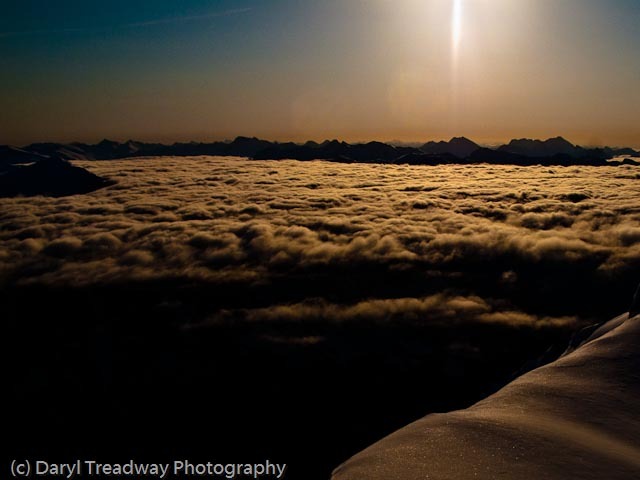 To summit and safely descend required all our wisdom, skill, commitment, fortune, and focus; and in return it gave us it's all. 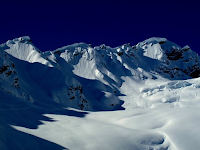 We know of seven others to ski here; two of whom were present, while Jack and Beaker's legacys remain written on the snow covered walls. We are so fortunate to have these days that we can share with brothers, and return home to share our experience with wives and friends (if our wives still speak to us). I earned 'husband of the year' status for my immediate return, while double D's and Jon attempted the dark north face. Jon was taken out by an unsuccessful river crossing in rising tides, while double D's slayed more long, perfect spines. March was amazing, but April is awesome! Weathered locals compare this season's snowfall to one more then a foggy decade past; a time before my time on the coast. I have never seen these mountains so perfectly plastered. Our challenge has been timing proper light for alpine descents, and the past 2 weeks our patience and perseverance was rewarded with a few clear days. 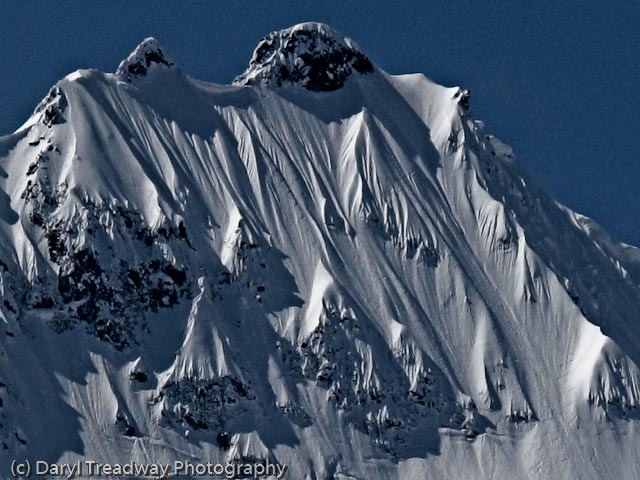 Bro Dave, Athan Merrick from Dendrite Studios, photog Chris Christie and I tapped into some of our local hills around Pemberton, squeezing out every possible shot the light would allow. After 2 long days of sun we had bagged some good lines despite the competition from many other amped film/photo crews feeling pressure to produce sunny segments. 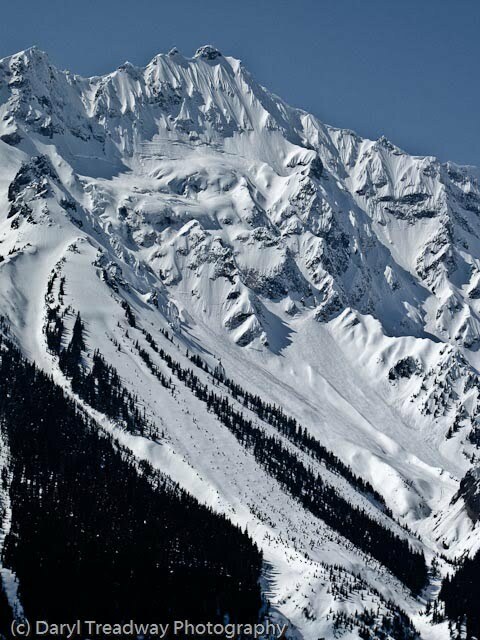 It was disheartening to see so many people in areas normally reserved for a dozen local Pembertonians, yet most respected the unwritten rules of the backcountry. Even Terje, who's heli used our skis as a landmark to guid them onto the peak we were setting up to ski, politely admitted to his greasy snowboard ways and let us work the face. 'What goes around comes around' and later that week we were the slower crew sledding up to the same group on the same peak. Athan and Nick are now pulling late nights to prepare for the Intersession film contest on Wednesday, April 20th; so I guess Dave and I will venture a little deeper, hopefully escaping the helis and hype of the crowded Whistlerites. I hate to plan trips in the winter, which annoys my wife ... and when I do plan, it still annoys my wife as I rarely keep plans. Weather, snow, and invariably others involved continually change. 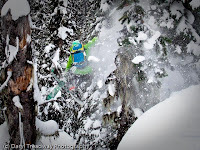 Consequently, my week and a half long plan of celebrating Griz Dayz in Fernie, BC, followed by a string of catskiing locations with a filmer, writer and photographer was diminished to two days at K3 based out of Sicamouse BC. I was tired of trying to communicate to anyone, and arrived at the Best Western, unaware that this would be our lodge. 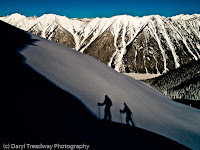 Photographer Bryan Ralph, skier Matt Elliott and I soon realized the benefits: close to cheep beer, a pool, cell service, privacy, and Timmy Ho's next door. As we turned off kilometer 3 of the logging road and climbed the switchbacks, our guide Carl explained the difficulties of keeping the road plowed to the cat, and even the troubles of keeping the cat roads maintained as it has snowed at least every four days this season. Our terrain was limited, but the snow seemed bottomless. 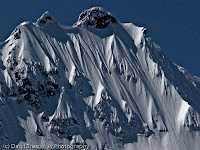 We were guests here with a purpose: to capture publishable photos, to gain photos marketable for K3, and to shred pow. And during our short stay we knocked off all three. Matt and I kept finding pillows jutting out of the trees and we would try and figure out a take off and landing, sometimes compromising both for the sake of some good old hang time. 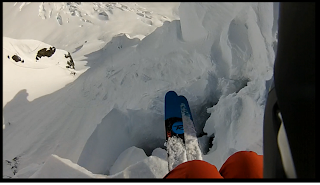 When one of us asked the other about the landing, the answer was always "oh yah, its good!" ... " Is it steep?" ... "oh yah, super deep!" Over years of skiing and surfing, I've learned the value of seizing the moment when conditions are right so Elliott and I jumped off everything we could find. On our last run we caught a glimpse of K3's bigger jaw-dropping terrain, which was a bit of a sucker punch, but also inspiration to return. The past two weeks have been incredible on the Coast Range; with meters of fresh snow, followed by sunny cold skies and a stable snowpack. 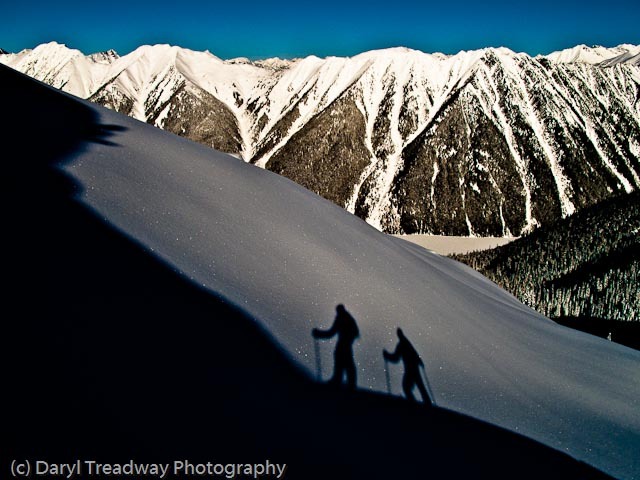 It took little convincing for Travis and Cheddar to join me ski touring from a cozy cabin to bold lines. The late and great Jack Hannan brought me here on our first ski-day together. At the time, I had no idea what Jack was about to expose me to in the following years. He opened my eyes, and the door to big mountain skiing; leading by example in his light-hearted yet focused and committed way. Now years later, with a clearer vision, I've returned. Its a big wall and I was happy to test the smaller shoulder's spine, feeling the place out. This was the deepest snow I've skied on something this steep. At times I thought the whole line was sliding on me, but it was ripable waist deep slough. This spine was the Warm-Up run... So stay posted to see how comfort levels adapt. 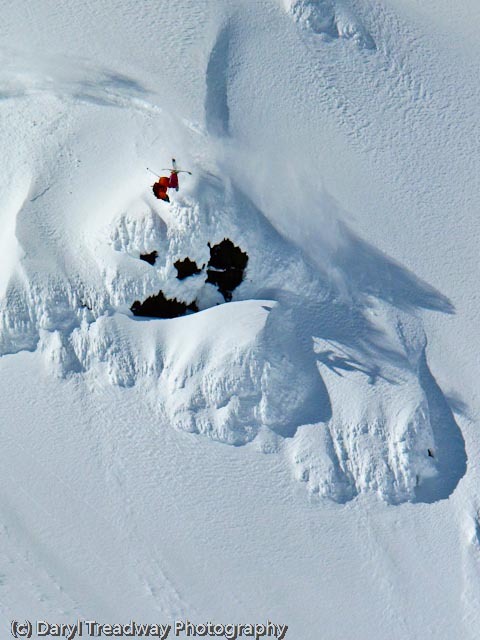 Back in my late 20s, I was in this frigid cauldron, spending a day's worth of energy climbing the deep snow of the north face. This time bro Dave and I returned with a different game plan. Accompanied by Jon Johnson, Chris Christy, and Joe Joeseph Lax we started early; making like a mullet and attacking from the back. 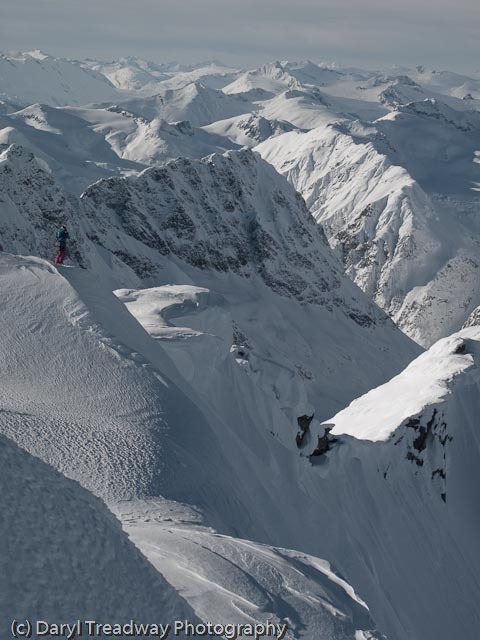 The day seemed all too easy, strolling up the south side in sunny firm snow, then shredding sweet steep spines down through the crevasse and cerac fields. A gem like Mt. Swensan/Swanson doesn't always present itself this easily, which is why few have experienced it's thrill. 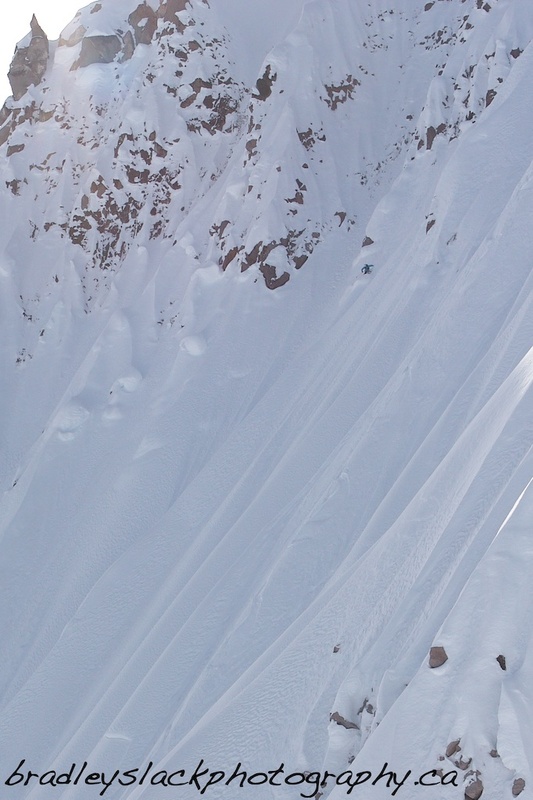 Years of recons, Google earth,a tested and trusted crew, proper snow and weather conditions, and God's blessing all came together for this successful day.